I recently received the newest retractable brush from Sigma and I'm in love! The Hollywood Glamour Flat Top Retractable Kabuki in Purple is a total-must have for your makeup bag. In this post I show you how to use it, and how it compares to the original. You all know how much I love the regular F80 flat top buffer brush from Sigma. It's my go-to brush for cream foundation, specifically, I like using it with my MAC studio tech foundation. I like it better than all of my other favorite fiybdatuib brushes including the MAC 109, MAC 187, etc. It's also great for buffing in pressed powders. 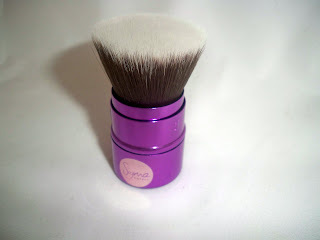 I find that using a brush like this is really good for male clients because when you buff in powder it doesn't feel like real foundation but you get the coverage you want, and clients feel like they're getting a mini massage :) Recently, Sigma came out with a small retractable version which is great for travel. Named after starlet Elizabeth Taylor, the Kabuki is compact and cute. I love the metallic purple design too! I put the brush to the test with my foundation. First off, side by side, you may notice that the kabuki is a bit bigger/wider than the original version. The bristles have just a bit more looseness to them which the originals are a tiny bit more densely packed. I used it with my studio tech to see if I'd notice a difference. The application was the same! It still buffed the foundation on to give an airbrush finish. I also love how you can kind of stamp on product with this for higher coverage. I pat on foundation on my cheeks to take away redness without removing the makeup. This is definitely going to stay in my travel makeup bag. The cap keeps the bristles safe and clean and I just feel extra stylist pulling it out. Also, I heard that some people prefer this version the the original because of the shorter handle...it makes application easier when you're up close to a makeup mirror. FTC Disclosure: Product was included as a gift for joining the affiliate program. I was not asked to write this review. I am affiliated with the company. This is such a pretty brush! 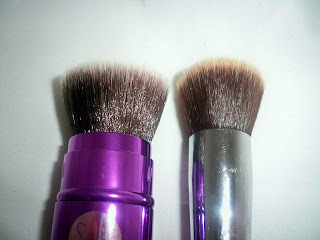 what's the difference between using a flat top kabuki brush vs. the original?